Yank my Doodle- a burnt orange crelly, opaque in 2 coats. Shh…it’s Top Secret- a blackened plum crelly, opaque in 2 coats. Freedom of Peach- a muted deep peach creme, opaque in 2 coats. Madam President- a rich jewel toned magenta creme (more pink IRL), opaque in 2 coats. Never a Dulles Moment- a banana yellow creme, opaque in 2 coats. CIA- Color is Awesome- a muted deep turquoise, opaque in 2 coats. We the Female- a merlot crelly, opaque in 2 coats. 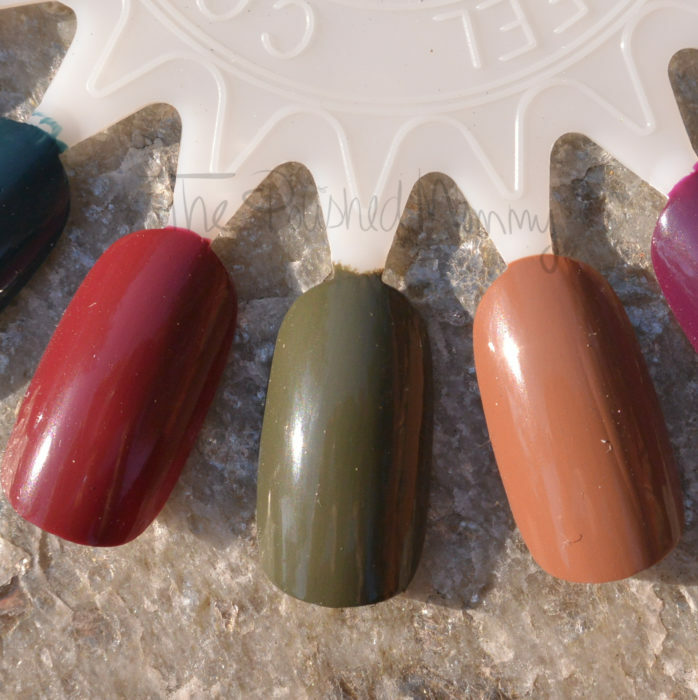 Suzi- The First Lady of Nails- a muted olive green crelly, opaque in 2-3 coats (3 coats shown) and can be streaky. Inside the Isabellet Way- a muted tan/ brown crelly,opaque in 2 coats. Kerry Blossom- a plum wine crelly, opaque in 2 coats. Stay off the Lawn!- a rich muted kelly green creme, opaque in 2 coats. Squeaker of the House- a taupe brown creme, opaque in 2 coats. OPI by Popular Vote- a muted magenta creme, opaque in 2 coats. Similar in color to Madam President but deeper. “Liv” in the Gray- a slate grey creme, opaque in 1-2 coats ( 2 shown). Pale to the Chief- a frosty beige creme, opaque in 2 coats and can leave brushstrokes. Overall: This is a nice Fall/Winter collection that has plenty of color to choose from. They have a nice formula (even the 2 with “issues” are easy to work with) and almost all cover to a full, opaque finish in 2 coats. The first look I created with this collection was inspired by the rich jewel toned shades. I started with a base color of Pale to the Chief then used Yank my Doodle, Shh…it’s Top Secret, Freedom of Peach, Madam President, Never a Dulles Moment, CIA- Color is Awesome, Kerry Blossom, & Stay off the Lawn with BMs303. 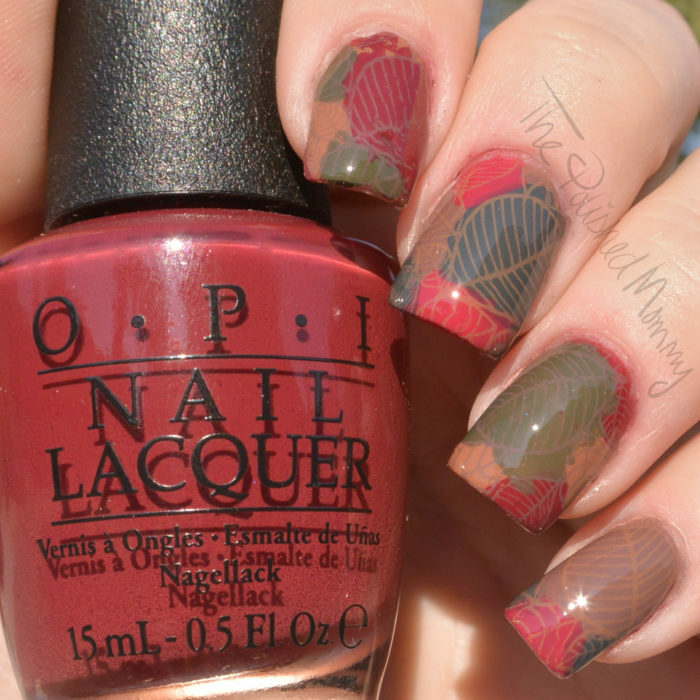 What is Fall without some Autumn leaves nail art?! I created a reverse decal using BM-023 and the muted, rich shades: We the Female, Suzi- The First Lady of Nails, Inside the Isabellet Way, Squeaker of the House, OPI by Popular Vote, & “Liv” in the Gray. 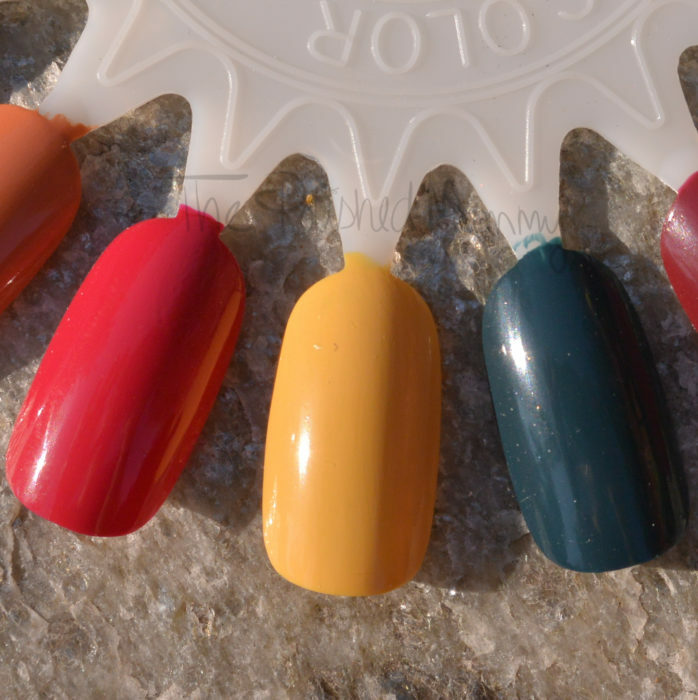 Freedom of Peach is a lovely shade, loving this vibrant collection! 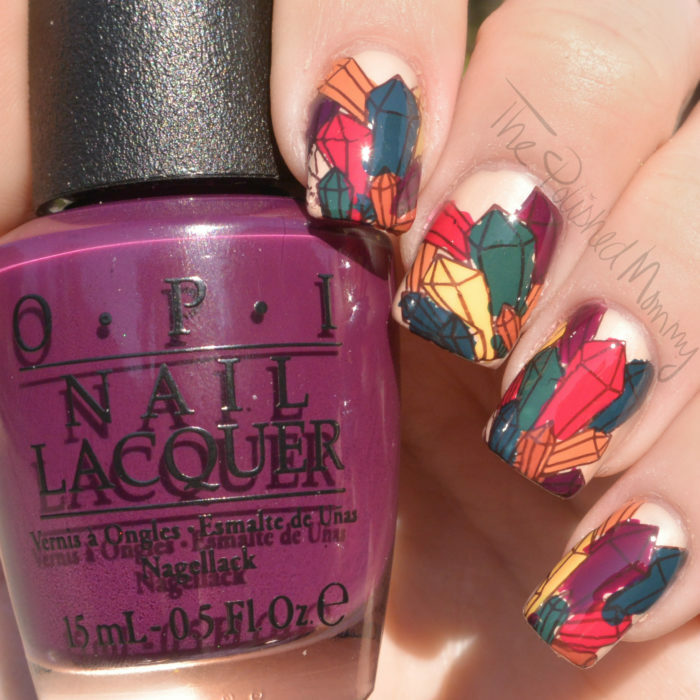 Gorgeous colors, and I love the leaf nail art so much!! the second art is my favorite! I need this collection! I love these creams so much! These are so ho hum, same old. I wish OPI would jump outside the box. I wish they would do more holos, shimmers and duochromes.